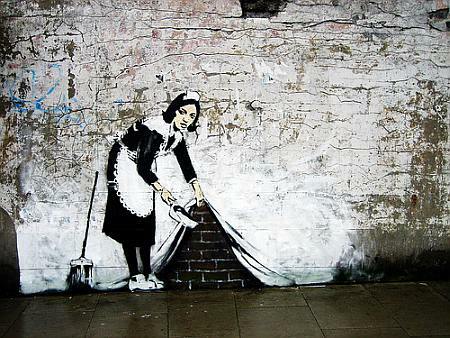 I’m very excited to see the new Banksy film Exit Through the Gift Shop. I’ve heard that it’s getting good reviews, though I’m doing my best to avoid them so they don’t ruin the movie for me (which extended trailers and reviews often do). 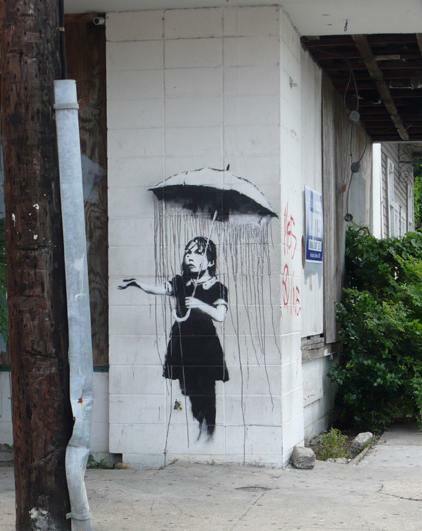 If you’ve never heard of Banksy, he’s a mysterious UK graffiti artist that uses stencils to create beautiful, moving works of art in public spaces, both to the delight and the chagrin of the public. I’m so inspired by people who make art just for art’s sake – not for galleries or to hang on the wall in a state of preservation. His work will be (& often is) painted over, torn down or eventually just washed away with the rain. But what a gift to be able to catch a glimpse of one on your way to work every morning or while waiting at the bus stop. Love it.